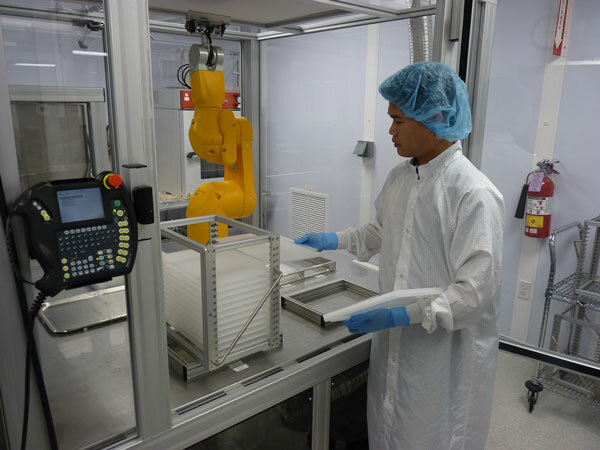 The field of contract medical device assembly has changed significantly in the past five years, according to Amit Arora, global market development manager at Nordson EFD (East Providence, RI). "Product features that were either too complex or cost prohibitive for companies five to seven years ago are slowly becoming mainstream." As a result, firms providing contract assembly work for medical device companies are stepping up their game. Chris Mazelin, marketing manager at Specialty Silicone Fabricators (Tustin, CA) agrees, noting, for instance, the broader trend of miniaturization, which is continuing unabated. This is especially true for implantable devices. "Every surgeon wants to do less damage to the human body. Nearly all of the devices that are being designed and manufactured now are becoming smaller," he says. The image, provided by Specialty Silicone Fabricators, shows an employee preparing the work space for the robot to take over and finish. The robot spreads a precise amount of a bioresorbable polymer mixed with an active pharmaceutical ingredient onto the plates. The result would be a sheet of drug-infused bioresorbable polymer. This combination product is currently in development. Another trend is the proliferation of electronics in medical devices. The growing use of neuromodulation technology over the past decade is one major trend fueling increased demand for electronics. In addition, the steady growth in computing power and miniaturization of memory are enabling electronics to be used in unprecedented medical device applications. "The ability to put more processing power in medical devices gives design organizations the ability to do more with less," Mazelin explains. Companies that do contract assembly work for medical device markers are responding to this trend by beefing up their ability to embed electronics into products. Technology firms serving medtech companies are also arming themselves with advanced technology such as cutting-edge robotics and lean production methods, which are enabling them to remain competitive against traditionally low-cost manufacturing destinations. "I see a lot of companies moving production and assembly back onshore," Mazelin says. In the late 1990s and early 2000s, a significant number of medtech firms moved assembly operations offshore to save cash. But now, the cost of doing business in those counties is rising. That is happening in China, for instance, where wages are rising to be on par with those in the United States. While other low-cost manufacturing destinations exist, many of them pose their own concern in the form of logistical or ecopolitical challenges. "The United States is going to compete in terms of its ability to innovate rather than cost alone by creating lean and efficient high-tech manufacturing processes," Mazelin says. Contract assembly firms are investing in robotics, which can be used for an increasingly diverse set of assembly tasks. Whereas in the past, robotics technology was a natural fit for large-scale production operations, advances in robotics have broadened the scope of applications so that assembly equipment can also be used for small-scale custom operations as well. "In the past, nearly all medical device assembly was all done manually," Mazelin says. "It has evolved into a semiautomated process." Arora has some data to back this up. In the United States, roughly half of assembly operations are automated and the other half is still performed using manual techniques, he says. Data supporting this comes in the form of a recent webinar by Nordson EFD with 90 attendees hailing from the life sciences industry--predominately based in the United States. "We surveyed the audience, asking how many used manual dispensing in assembly. They could pick multiple options and about 50% reported using some kind of manual dispensing." Still, the use of robotic technology is becoming more common as its capabilities increase. "Vision capability in robots is becoming standard now," Arora says. "There are a lot of companies that say 'we don't need vision,' but if they can have it at the right price, why would you not go for it? People are increasingly adopting it," he adds. "People who have shied away from using it in the past are now finding it helpful in reducing rework and the reject rate." Vision technology can also save time during assembly operations requiring dispensing of adhesives or other compounds. "If the part you are dispensing adhesives or compounds onto has moved because of the base plate fixture, that could throw off your parameters by quite a bit," Arora says. "Using vision capability, you could make adjustments on the fly, which could save you time from not having to recalibrate." Such systems are also becoming increasingly intuitive to use. "You can look at what you are dispensing in real time and control the robot purely using software and a computer with a very intuitive graphical user interface (GUI)," Arora says. "I would say you don't need as extensive training as you would have needed five years ago because the user interface is better. If someone has used Microsoft Windows, they could easily learn how to use the GUI to control the robotics."